One of our newest arrivals! Perfect for creating a beautiful indoor/outdoor chat space. 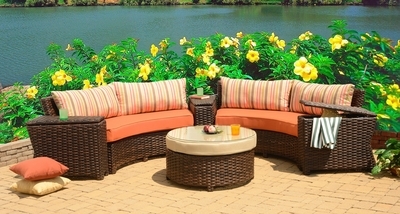 This unique sectional features a thick core “All-Weather” woven polyresin vinyl in Bordeaux finish over a sturdy frame. The ottoman easily turns into a coffee table with the use of an included glass top. The wedge tables have hinged lids to provide handy storage for toss pillows or other accessories.